MAYBE it’s in our bones. That urge to seek water. To go down to the river. Years ago, when I lived in Brooklyn Heights, I would walk to the edge of the Promenade and take in the view of Manhattan rising across the East River — and long to continue down to the edge, to feel the current rushing by. The view was spectacular, of course, but the experience ultimately disappointing, because I could only lean against the railing, looking down on those warehouses and long piers below, as trucks rattled beneath my feet on the Brooklyn-Queens Expressway. But now, there is Brooklyn Bridge Park: 85 acres that follow the river for more than a mile, beginning at Dumbo, along a tidal shoreline, to the six reclaimed piers that extend from beneath the Brooklyn Bridge, straight down to Atlantic Avenue. Building began six years ago at opposite ends of the park, Pier 1 and Pier 6. 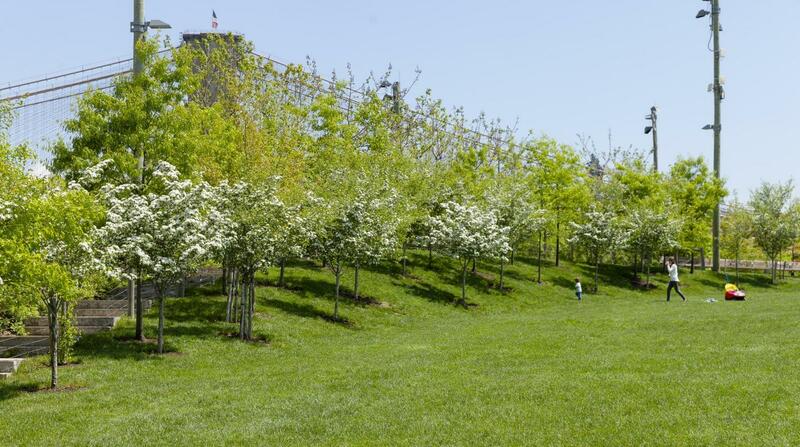 The first trees were planted in 2009, and by the next year, people had begun to wander the mounded hills, with their glorious lookouts over Pier 1, and to take their children to the lush playgrounds and water park on the eastern side of Pier 6. Now about two-thirds finished, the park continues to open in stages: The sports fields on Pier 5, with its lively picnic peninsula, opened in late 2012. Squibb Bridge, which connects the Heights to the river, opened last year. The long-awaited ball courts on Pier 2 — now filled with the pounding feet of basketball players and the thwack of handballs — opened in May. Other spaces have followed in swift succession this summer: a roller skating rink; and a little sandy beach facing the remains of Pier 4, which is now a bird sanctuary complete with osprey nest. A couple of weeks ago, I stepped onto the plank-and-cable bridge that begins at Squibb Park, just north of the Promenade, and zigzagged my way through thin air to the riverside. The airy walkway, made of heavy black locust, so naturally resistant to rot and insects that it needs no chemical treatment, bounces a bit — alarming grown-ups, delighting children — as you cross, like a hiker over some canyon in Yosemite. Only this is Furman Street, not a river you look down on, with the roar of the expressway, not a waterfall, at your back. The bridge descends this way and that, for more than 400 feet, until the leafy tops of bur oaks and yellow buckeye trees rise reassuringly above the wire mesh railing, letting you know that terra firma is not too far below. Here among the treetops, right across from Pier 1, you can take in Manhattan’s skyline of steel and glass rising to the west, the muscular gothic beauty of the Brooklyn Bridge to the north, the Statue of Liberty way to the south, raising her tired arm toward the Atlantic. I think of this as the soaring park, because of these views that stretch in all directions, changing with the light and where you choose to wander, the heady mix of salt and beach roses and diesel from the tugs filling your nostrils. It’s hard to believe that all this nature is artificial, highly engineered weirs and underground cisterns, tons of constructed soils and rocks placed with mathematical precision on these piers, where great ships once docked, and thousands of longshoremen trundled goods in and out of the sheds. In the evening, I glimpsed the river through the wide, spreading branches of a catalpa tree and walked down to the edge of Pier 1, where the long railing gave me another vista, this one straight south, as if I were racing along with the current. Huge thunderclouds were rising over Manhattan, and a wind blew up, turning the water to choppy waves that sent salt spray over the railing. On a quiet afternoon a week later, park visitors paddled kayaks in the sheltered cove, where you can watch the tide rising and falling among exposed piles and moving up and down the boat ramp edged by a spiral of riprap, the big chunky stones that edge the shoreline. It’s this juxtaposition of intimate little spaces and expansive views that makes the park so exhilarating and a place to return to in different light and seasons. Michael Van Valkenburgh, the landscape architect whose team designed this masterwork in collaboration with the Brooklyn Bridge Park Corporation, recalls walking down to the end of the piers 15 years ago, when the sheds were still in place. We had walked down the wide path that skirts the north side of the soccer field on Pier 5, where tall steel posts, remnants of the old shed, anchor the high mesh that keeps balls from flying out. The posts also set up a rhythm, like some 18th-century line of poplars, sweeping the eye down the pier and straight across the river to the turreted roofs of Ellis Island. We walked out to the end of Pier 6, still a bare slab, painted with lines and circles that mark where paths will curve through an acre of flowers — a constructed New England meadow — edged by seaside survivors like pitch pine, bayberry and tupelo. It will open next spring. “We’re actually lower than the tip of Manhattan here,” he said. “It feels like we’re on a boat headed for an island out there.” It kind of did. On the east side of Pier 6, the din of shrieking children announces the Water Lab. Here among the rocks and trees — an engineered version of a New England water hole — children are screaming beneath the water jets, jumping from rock to rock, puzzling together how to open the dam and release water down a slide. Everyone is barefoot, plopping down in the cool shallows or lying back on big square blocks of recycled wood, in the dappled shade of the smoke trees and sumacs that form a leafy room. Pines and dawn redwood trees are growing out of rocky islands. He offered Amalia Phoenix Dolezal, 2, who lives next door to the park, on Furman Street, some of his popcorn in a plastic zip bag. The two ran off together to watch water spout out of a whale rock. Mr. Van Valkenburgh and I strolled north, inhaling the aromas of spicy meats grilling on the picnic peninsula, where bright blue umbrellas shade sturdy tables made of longleaf yellow pine, dismantled from a shed on the old piers and milled locally. “There are no tropical hardwoods in the park,” said Mr. Van Valkenburgh, whose team has recycled tons of wood and stone. We paused by the sandy beach that now meets the river, where most of a rotting Pier 4 was carried off in a storm years ago. Mr. Van Valkenburgh beamed at the children wading and wriggling their bare toes in the sand. A little sign poking out of the beach grass says, “No swimming or wading.” Nobody pays attention. Her quiet words were a revelation. Who needs to escape the city when you can walk down the street — or take the F train to Jay Street or the No. 2 to Clark Street or the B63 bus that goes right to Pier 6 at Atlantic Avenue — and see nature in the city. There are thousands of trees and plants here — sycamores and maritime oaks, sumac and paulownia trees so tough they grow out of sidewalks and vacant lots. They can take the salt and wind, the beating sun, drought and driving rain. They hang on when a storm like Sandy blows up over the riprap, which buffers the shoreline from the pounding waves. I headed down to Fornino — a pizza parlor on top of a salvaged shed on Pier 6 — to sip a glass of chilled prosecco on the roof and watch the sinking sun turn all those Manhattan skyscrapers gold and orange as a tugboat pushed a barge full of crushed cars down the river.